Jean was the sister of my grandfather Alexander Simms. Her parents were Irish immigrants William Simms and Agnes McAllister and her grandfather was Henry Simms. 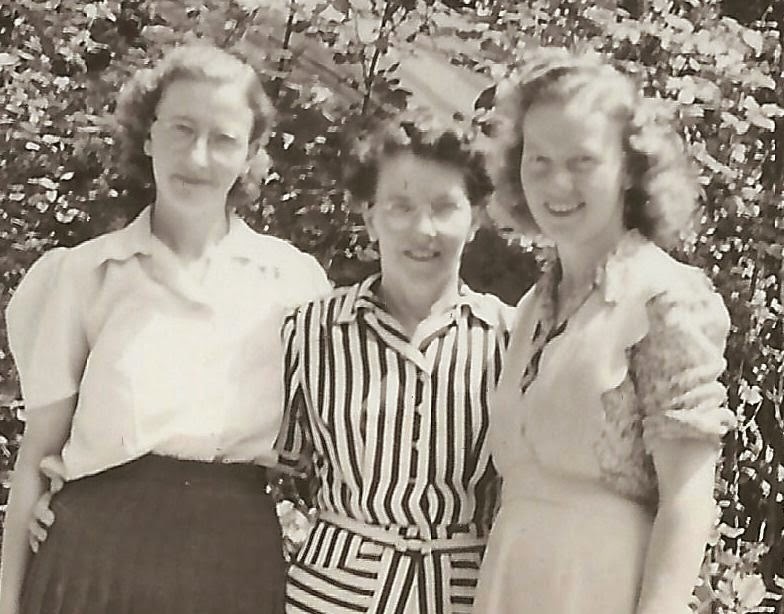 Her older sister Mary Simms Bryan was previously featured on this blog. 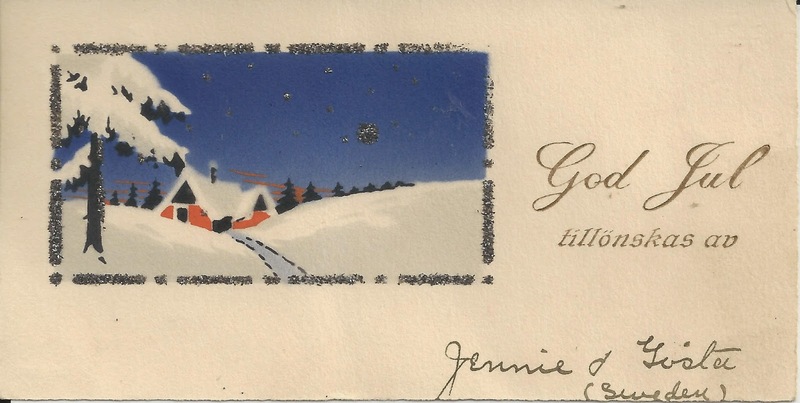 The online birth registration at Ancestry.ca from 1887 says her given name is Jennie. She was born in a farming family of 3 boys and 5 girls at Mountain in Dundas County near Ottawa. An online copy of Volume VII of the Canadian Nurse Journal from September 1911 (page 417) records the graduation of Miss Jennie Simms from Mountain, Ont from the Lady Stanley Institute of the Protestant Hospital in Ottawa. This nursing school operated on Rideau Street from 1890 to 1924 under the direction of the wife of the Governor General and originator of the famous NHL trophy, Lord Stanley. 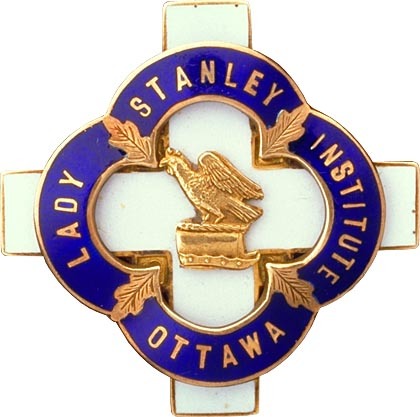 Jennie was one of a class of 12 nurses that graduated from a course of study on May 30, 1911 and would have received a pin as pictured below. 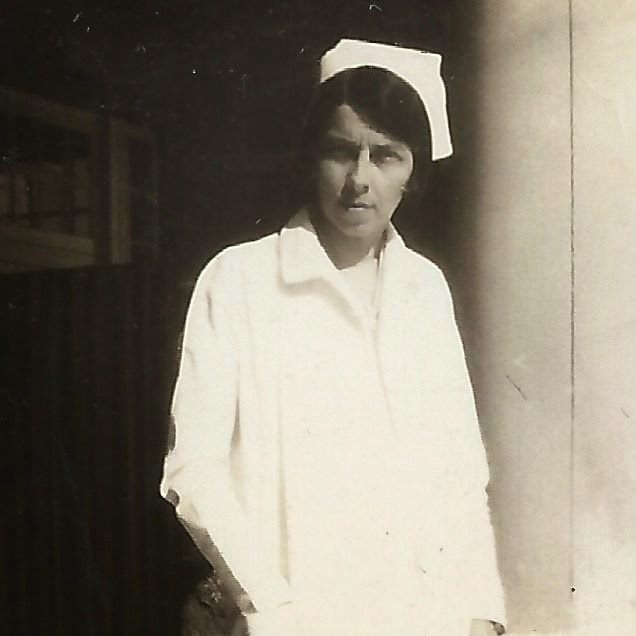 The photo at the top of this blog post was shared by my cousin Marilee but I have had no luck finding Jennie as having served overseas as a nurse in WW1. The Veterans Affairs website says 3141 Nursing Sisters in the Royal Canadian Army Medical Corps had roles in the conflict and 2504 of these were sent overseas. Forty-five of these women died in service to our country. It would be most interesting to find out more about this time in her life. 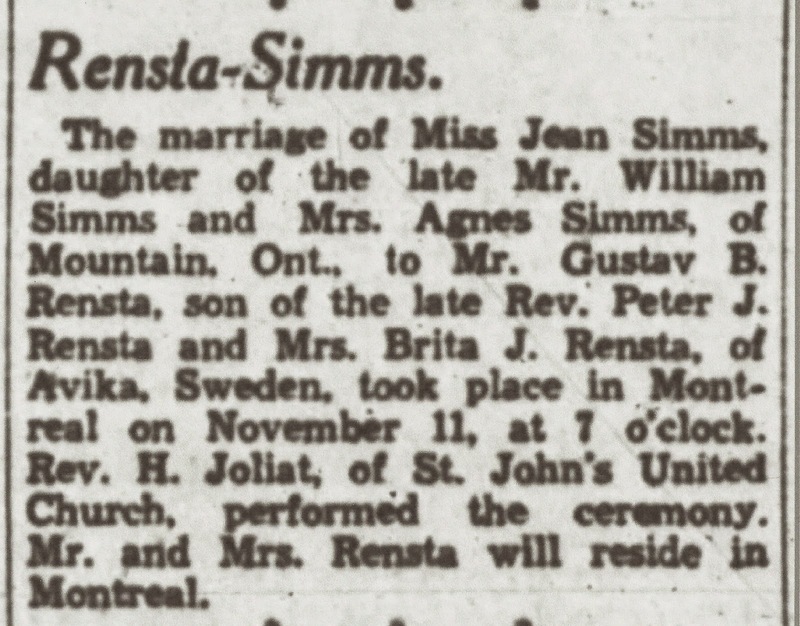 Bror Gustaf Benjamin Rensta is found on an immigration document on Ancestry.ca as born in Brunskog, Sweden and arriving in Canada on September 27, 1924. 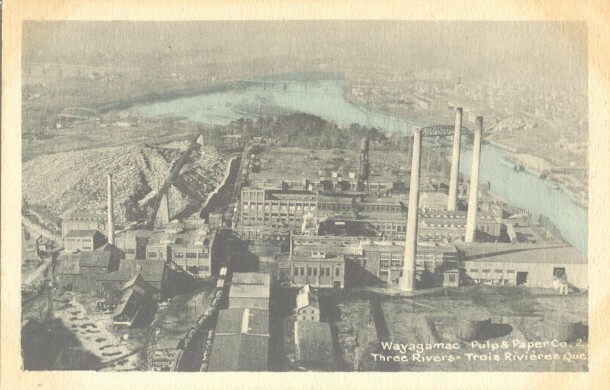 Documents he filled in say he intends to take up forestry when he arrived in Canada for the Wayayamack Pulp and Paper Company in Three Rivers, Quebec. 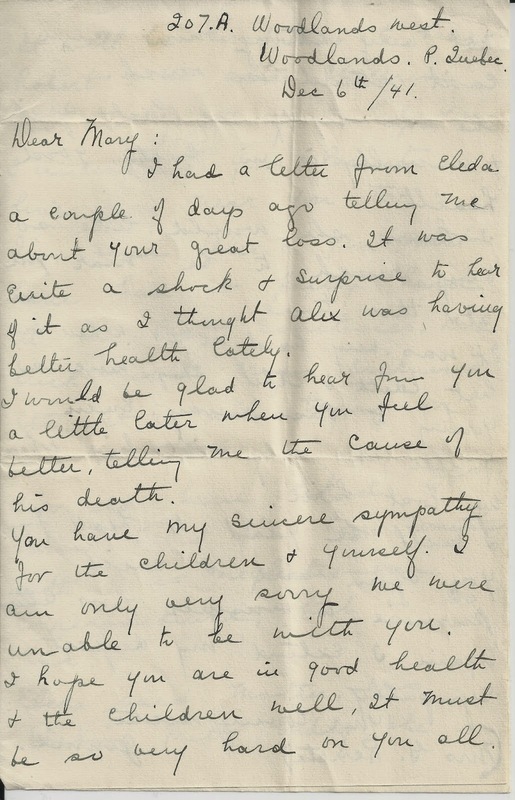 I had a letter from Eleda a couple of days ago telling me about your great loss. It was quite a shock + surprise to hear of it as I thought Alex was having better health lately. I would be glad to hear from you a little later when you feel better telling me the cause of his death.You have my sincere sympathy for the children and yourself. I am only very sorry we were unable to be with you. I hope you are in good health + the children well. It must be so very hard on you all. It will be a comfort to have Robert + the older children who are grown up to help you. I understand your parents live near you too.I'm sure Alex + you must have had it pretty hard in the past sometimes. Bad luck with crops, sickness etc. 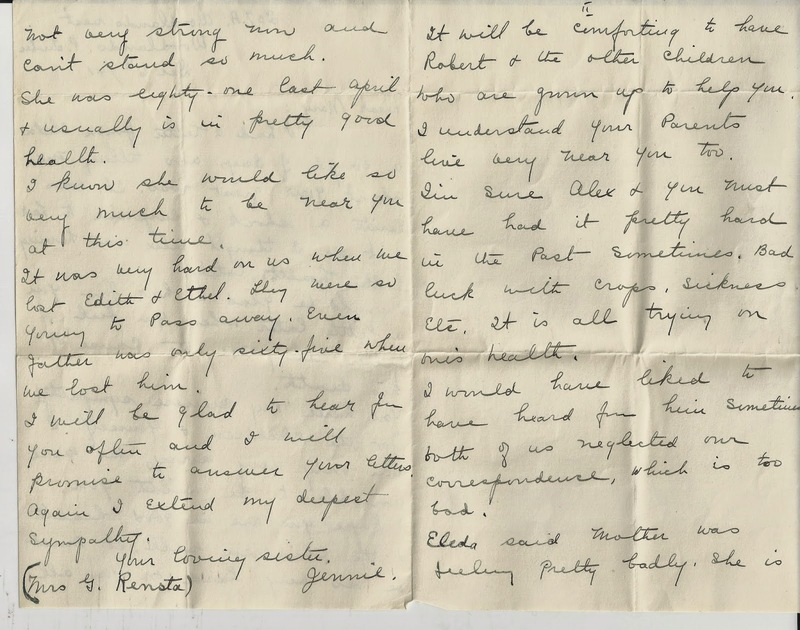 It is all trying on one's health.I would have liked to have heard from him sometime both of us neglected our correspondence which is too bad.Eleda said Mother was feeling pretty badly. She is not very strong now and can't stand so much. She was eighty-one last April + usually is in pretty good health. I know she would like so very much to be near you at this time.It was very hard on us when we lost Edith + Ethel. They were so young to pass away. Even father was only sixty-five when we lost him.I will be glad to hear from you often and I will promise to answer your letters. Again I extend my deepest sympathy. 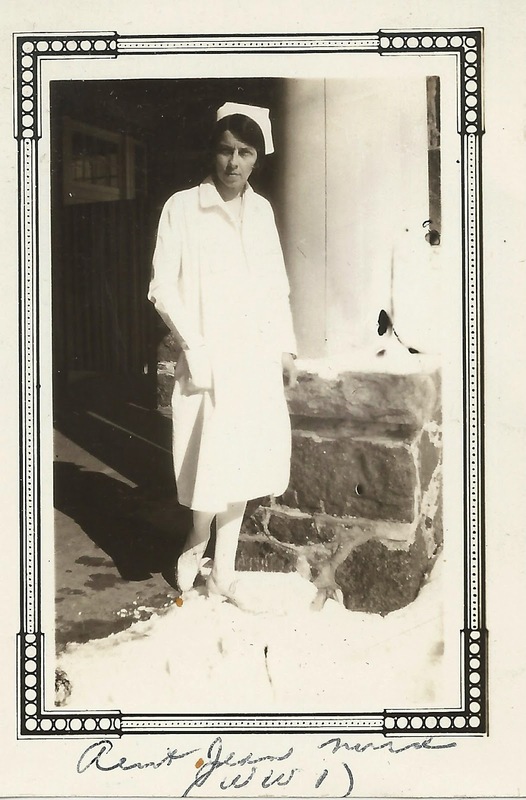 She and Gustav lived along the St Lawrence River in Montreal in 1945 when my Aunts Dodie and Gwen made a trip there to visit relatives. 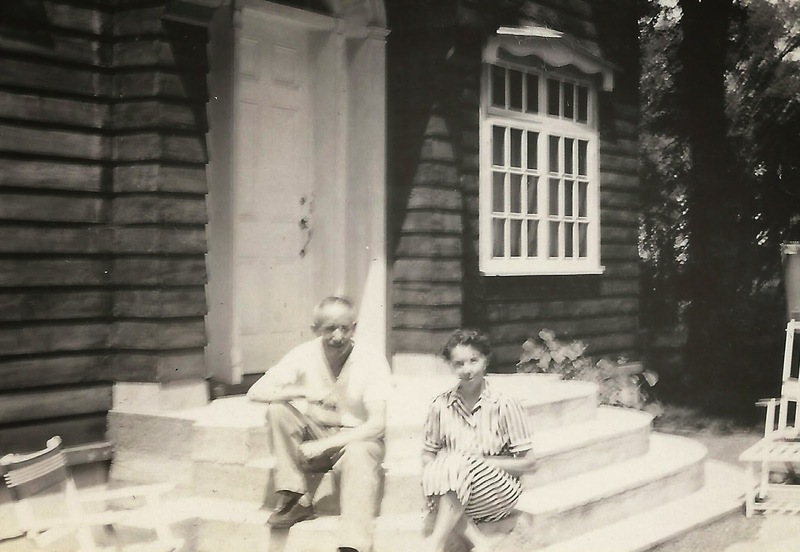 The photos below were taken then, of Gustav and Jean and below that Dodie, Jean and Gwen at the Rensta home in Woodlands, Quebec near Montreal. Aunt Dodie's address book from the 60's lists Jean and Gustav at 817-5 th N.E. Deerfield Beach in Florida as well as 6506 Denbigh Avenue in South Burnaby, B.C. Lois Jane kindly took this picture and submitted it to Find-a- Grave. Jean and Gustav are buried in the Kelowna Memorial Park Cemetery at 1991 Bernard Avenue in British Columbia at plots at C 2 -87- 46 and 47. 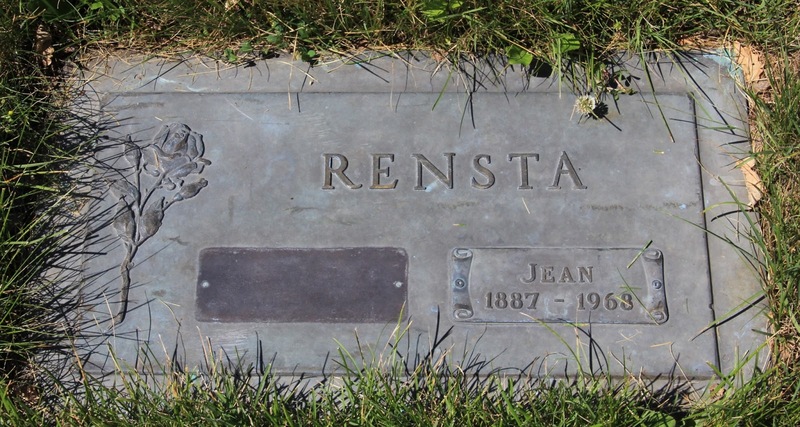 Jean died on June 5, 1968 (on the same day that Bobby Kennedy was shot) and her husband Gustav on May 11, 1976.